The scene: The parking lot behind the office. It's been raining apocalyptically for‎ the better part of the past 24 hours, and now the winds are beginning to pick up, too. 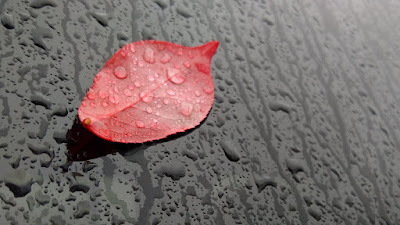 The sky is a menacing shade of dark, steel-grey, and the ground is slick with puddles and widely scattered leaves. 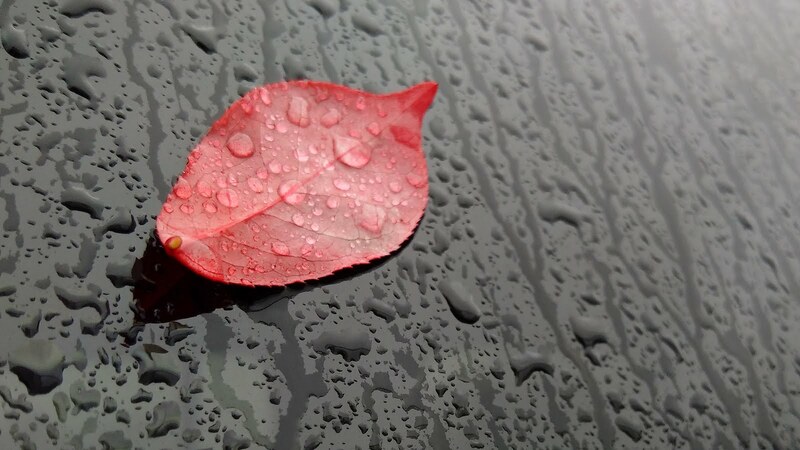 As I step over to the driver's side door of my car, this single red leaf on the window catches my eye. I'm pretty sure the world has more than enough pictures of single red leaves, but I decide this moment needs to be remembered. Perhaps it's because a quick pause in the middle of an otherwise chaotic week is good for the soul. Or maybe I need a reminder of how lucky I am that I can still walk, drive, shoot, live, or otherwise do whatever I need to do.‎ Because so many others can't. As I take the shot and tuck the phone back in my pocket, I realize I can't fully explain why I stopped in the first place. But not everything needs to be explained. Thankfully we'll never have enough, and those glorious moments we stop to notice (pick up and take away) the better we are for it! It's a keeper Carmi! Says me the recent leaf collector gathering up leaves in Alabama that I've never seen before! Double win! I personally do not think there are enough single red leaves. This one was clearly meant for you! Lovely shot and post. I love this time of year when the leaves are all red, orange and yellow, just before they turn brown.